"Happy families are all alike; every unhappy family is unhappy in its own way." After passing through Norfolk and anchoring in Hampton Road, I must say I was a bit nervous about the grand old Chesapeake. It looked like a mighty big inland sea to me, with all the challenges shallow, open water can bring. And my worries were only confirmed by my first night in a little anchorage between Ft. Monroe and the Hampton Roads Bridge. As you can see, this anchorage has great protection from north and east winds. Since the bridge is up on pilings, not so good from the west and south. Now, I don't like to complain over and over about the same thing, so I haven't been moaning about the north wind that's been plaguing me since Jacksonville. Actually -- now that you've got me going -- it seems to me I've had contrary winds since the west coast of Florida. When I was going south, the wind blew from the south. When I was trying to get across Lake Okeechobee, the wind blew (hard) from the east. And when I finally turned the corner and headed north in Stuart, yup, the wind started blowing from the north. So you will forgive me for assuming that the wind would continue to blow from the north, and this would be a snug little anchorage for the night. I anchored the Blue Moon close to the northern shore of this little cove, rewarded myself with a nice supper, and went to sleep. Of course, in the middle of the night, the wind swung round to the west and started howling. I was now 100 yards from a lee shore, so I sprang out of my sleeping bag, pulled up the anchor, motored off the lee shore into the middle of the anchorage, and put down my 35 lb 'safety' anchor with plenty of scope. Whew. I was safe enough, but hardly comfortable in this now rolly-polly anchorage. The next morning, the wind was again howling out of the north, so I decided to stay put and get a handle, once and for all, on this weather thing. Back in Southport, NC, where I'd participated in the Wooden Boat Show, I'd met a great guy named George Ray. He'd been nice enough to give me a ride to a grocery store and, while we were shopping for grub, told me about something called GRIB data. I'd never heard of this stuff, but he said it was the best thing for marine weather forecasts -- particularly for the kind of weather sailors care most about: wind and waves. I'd tucked this bit of information away for the future, but since I was stuck in port with a good Internet connection, I decided it was time to check it out. This set of data is for the Chesapeake and Delaware Bay, with a bit of the Atlantic. The forecast wind speed is shown by the 'L' shaped arrows. The bottom of the 'L' shows the speed. A short 'feather' means 5 knots; a long feather means 10 knots; the feathers are cumulative, so if an indicator has a long and a short feather, as they do over the eastern Chesapeake and Atlantic, that means 15 knots. The direction is shown by the top of the 'L'. The wind blows from the bottom of the 'L' to the top. That is, from the feathers, to the tip of the 'arrow'. In the diagram above, the wind is blowing predominantly from the north west, from 5 knots in the NW corner, to 15 knots in the SE corner. The forecast wave height is indicated by red shading. Heavier shading means higher seas. South west winds, 5-10 knots. 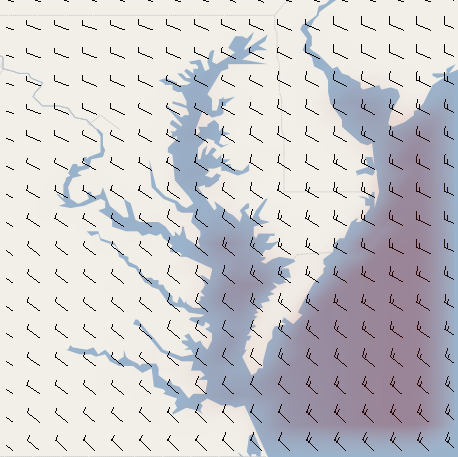 Perfect for sailing up the Chesapeake, and the first south wind I'd seen in a long time. In short, after sitting out one day of foul north westerlies, I had a week of lovely, warm south west winds that took me all the way up the Bay. Not much 'excitement', but who can complain about good weather, great anchorages, and friendly people? I'll continue with the travelogue tomorrow, and will wrap up by passing on George's excellent recommendation to find a GRIB application for your PC or Mac and learn how to use it. Most of them give hourly forecasts for up to 5 days. After using it for a week, I can say that the forecasts are very accurate for 1 day, and reasonable accurate for up to 3 days. The hourly forecasts let you see the winds forecast for the night, so you won't be taken by surprise by a sudden wind shift that puts you on a lee shore. And it's terrific for planning the next day's cruise and choosing an appropriate anchorage for the end of the day. Excellent for planning and staying out of trouble. Thanks, George! Excellent info, John. I'll pass it along to my daughter who sails on San Francisco Bay and to the local racing sailors here on Tawas Bay of L. Huron. Fair Winds (hopefully from here on out) for you! We love the Bay and are enjoying your blog. "from 5 knots in the NW corner, to 15 knots in the SW corner." should read: to 15 knots in the SE corner. Sorry, I'm a Virgo and have found few things I could help with in this wonderfully written blog. Gosh, now I hope I got it right!